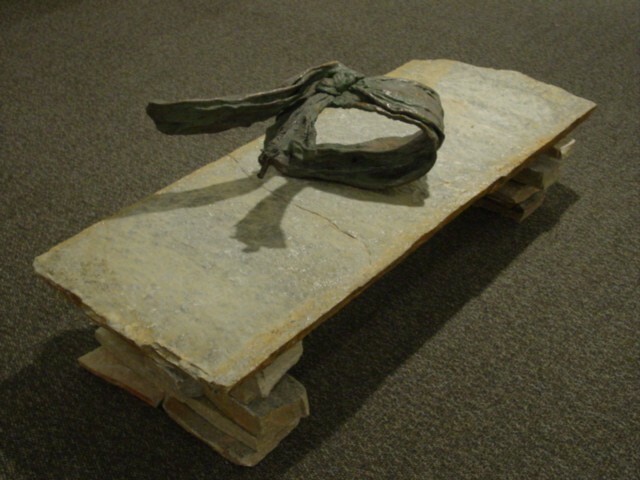 24" w, 2"9 L, 20" H, 24" x 80"
The Shroud, defines a human shaped space resting on Indiana Limestone about 24" x 80 " The Shroud is life-size and the base rests about 18 inches high. It is about the absence of the human figure that is defined by the shroud. It is cast bronze. The base could be supplied or special order type of stone, and the casting would need sixty days lead time after ordering. This is the original and there will be up to 12 castings of this piece in all. Each one will be slightly different. The casting is priced separately from the stone, the price of the stone will vary and may be purchased elsewhere to reduce the cost and allow for personal preference. I like the stone rough and as natural as possible.